Comment compiler Apache et PHP sous WHM ? Please note that recompiling with Easyapache can automatically update Apache or PHP, if the version you are using is no longer supported. It could also overwrite any manual configuration. WHM provides a wizard called "Easy Apache" to configure and recompile Apache and PHP on your server. Log in to WHM as a root user. Go to the "Software" section. 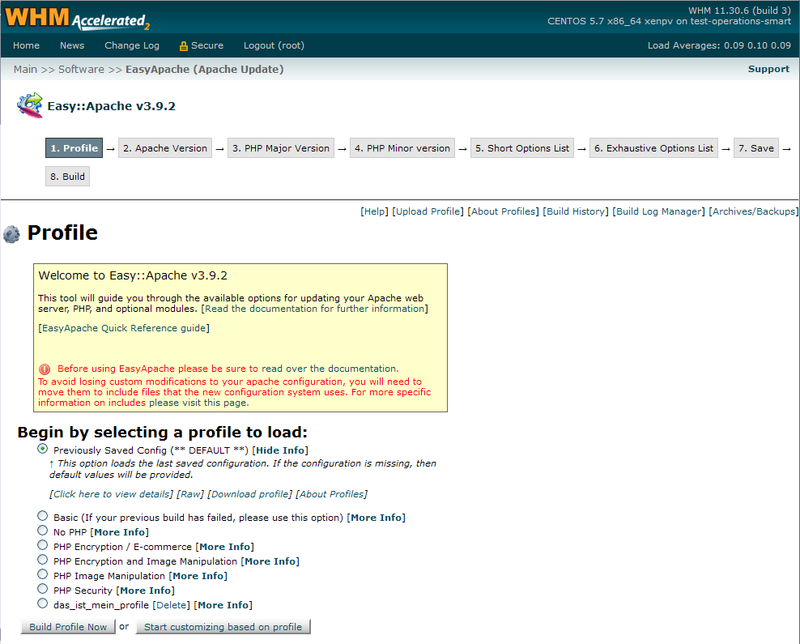 Click on "EasyApache (Apache Update)". Previously Saved Config (** DEFAULT **): This option loads the last record of the configuration. If the configuration is missing, then the default values will appear. Basic: This configuration includes a very basic set of Apache and PHP options. No PHP: This is probably not an option for many web hosts. If you choose this option, PHP will not be available and pages in PHP will not work. PHP Encryption / E-commerce: This profile uses the "Basic" configuration and adds the mcrypt encryption libraries to PHP. This library is often used for e-commerce encryption. PHP Encryption and Image Manipulation: This profile uses the "Basic" configuration and adds the mcrypt, GD and FreeType libraries to PHP. PHP Image Manipulation: This profile uses the "Basic" configuration and adds the GD and FreeType libraries to PHP. PHP Security: This profile uses the "Basic" configuration with the addition of Mod suPHP to add security and tracking measures for PHP scripts. Tap the "Build profile now" option. Recompiling Apache with the selected profile will start, wait until the compilation is complete. Press the "Start customizing based on profile" option: Choose this option when you want to add modules to an already existing profile or when creating a custom profile (refer to the procedure below). To create a custom profile and recompile Apache ("Start customizing based on profile"), please follow this procedure:Click on "Start Customization based on profile". Select the version of Apache you want. Click on '' Next ''. Select the PHP version you want. If you need to run PHP4 as well as PHP5, you can select both. Click on '' Next Step ''. Select the specific version of PHP. Click on '' Next Step ''. This step corresponds to the "Short Options List" section, mainly for PHP. Select the features that you want to include in the Apache and PHP configuration on the server. Click on "Exhaustive options List". At this point, you can select the Exhaustive options (for PHP and Apache). This step gives you a complete list of additional Apache features as well as a list of additional PHP modules and loaders. Select the modules you need. Click the "Save and Build" button. Now the wizard will start Apache recompiling. Watch the screen carefully and note if there are any error messages that are displayed. When the creation is complete, check that the PHP pages are correctly loaded.